800-253-2363 Need More Info? Free Shipping	Chat Live! 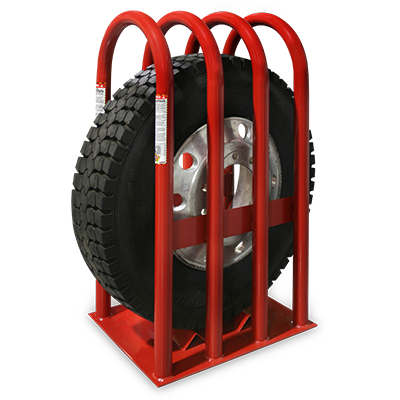 At Ranger Products, all of our tire inflation cages are constructed with your safety in mind, as well as the safety of your employees. Our cages meet strict OSHA Standard 29 CFR 1910.177 requirements for tire service workplace safety and can accommodate virtually every type of tire and wheel combination, ranging from small passenger vehicle tires to long-haul truck, bus, off-road and military tires. Tire cages protect technicians from dangerous tire explosions. These cages aren’t just regular steel cages. They are carefully inspected and certified to rigidly upheld safety standards. Ranger uses the best materials and adheres to the highest standards for our cages, so you can purchase them, rest assured that you and your technicians are safe in a worst-case tire explosion during inflation. The RIC-4716 inflation cage is a crucial, life-saving piece of equipment that must be used during the inflation of a tire. Tire explosions are deadly, and only a ruggedly constructed tire cage can prevent catastrophic damage in a worst-case scenario. Starting at $565 + FREE SHIPPING!